Came across the following regarding an old news clipping which was discovered by a genealogist in an old family bible. It has been estimated the article was to have been written in 1910, and according to it Sarah Parker was only 15 years old when she married Charles Brandon, who had already fathered 10 children from two earlier marriages. 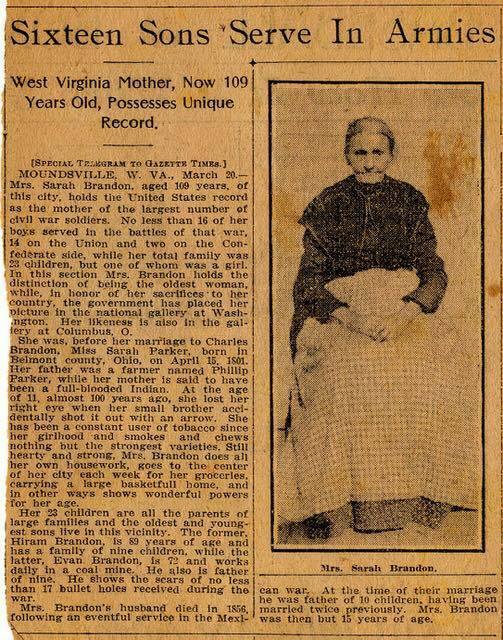 According to this article and additional research she is said to have had 23 children before her husband died in 1856. Of the 23 children, all were boys except one. Apparently there were some multiple births among the children that were born, as it appears to researchers that only 17 years separated her oldest son who was 89 when the article was written to her youngest who was 72. Sarah is also said to have been blind in one eye from the result of having been shot in the head by an arrow by her brother when she was younger. The article goes on to say that sixteen of her sons served in the Civil War (14 for the Union and 2 for the Confederacy). The youngest son, Evan Brandon, was 72 at the time of this interview and had the scars for 17 bullet holes received during the war. Further research by genealogists turned up a profile of Charles Brandon in an old book called American Flint, Volume 8. Which details what happened to some of the sons in the war under the heading Moundsville, W. VA.
Incredibly interesting, Bruno, thanks. Personal stories always bring things much more in focus. Many years ago I read a Reader's Digest story of a man, then still alive, who as a small child had watched Wyatt Earp and the rest shoot it out at the OK corral. I did a lot of volunteer work for the local archives. Some of this involved looking for letters of probate for local people in the national "calendars" listing deaths. It meant searching through hundreds of microfiche, brain keyed to spot the word "Gloucestshire", and then noting certain details. Most details were bare minimum, others more filled, relating how, say, a 26 year old man died under mysterious circumstances in Hong Kong in 1896 whilst working for the British Embassy. Now, there just has to be a story behind that! Somewhere on my computer there is also a load of files of photos of articles from a local paper during WW1. There was a chap there who lost all his sons, seven IIRC, during that war.